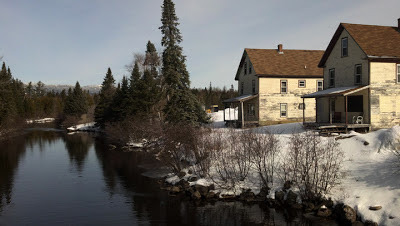 Just an hour north of Bangor is a beautiful lake and mountain region, with secluded villages and towns along the way that seem to have defied time. They have kept their unique heritage while the cities have moved on. 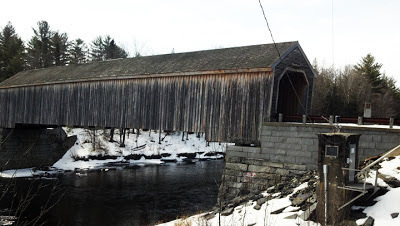 Greenville is slightly northwest of Bangor, while Millinocket and Baxter State Park are northeast, but the mountains connect within the valleys, if not by road, then by rivers, lakes, streams and forest trails. 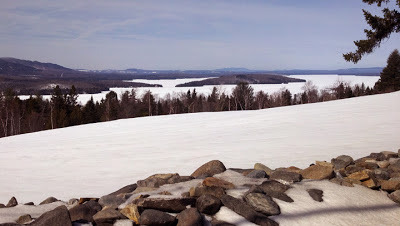 The cluster of mountains is sometimes referred to as The Highlands of Maine, especially by other romantics like myself. My husband and I took an afternoon drive yesterday up through Greenville and into Kokadjo. We have never taken this route by car, only by snowmobile. 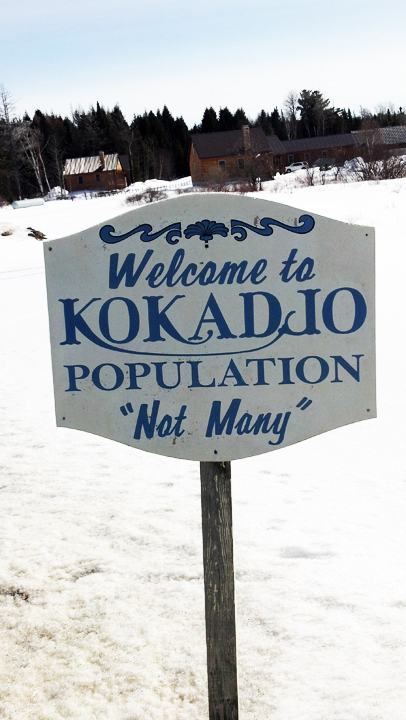 We learned that our car’s GPS system didn’t recognize Kokadjo as a town—that’s how isolated it is. 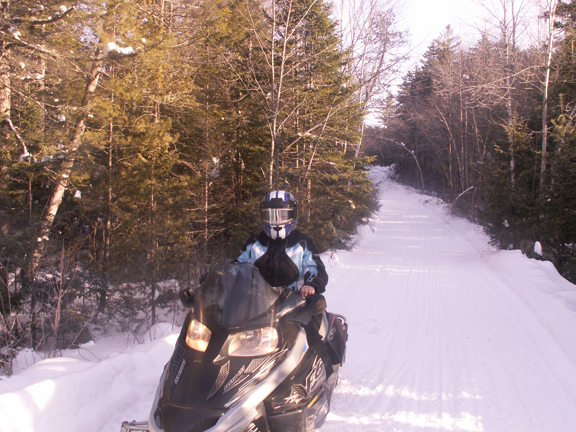 To snowmobilers it is a central hub for gas, and it is right in the center of all those beautiful forests and mountains. Winter thaw has begun. Snowmobilers are expecting just one more weekend before mud season is upon us. I love this area of Maine, so much so that I set my first book here. While I have made up my own fictitious village, the environment is very real and just as isolated as I have portrayed in my series. Wolves could easily hide for centuries in one of these villages in the valley of mountains, where modern devices can’t even locate. Mine have! The moose will perhaps one day become extinct; but how naturally then, when it exists only as a fossil relic, and unseen as that, may the poet or sculptor invent a fabulous animal with similar branching and leafy horns, — a sort of fucus or lichen in bone, — to be the inhabitant of such a forest as this! 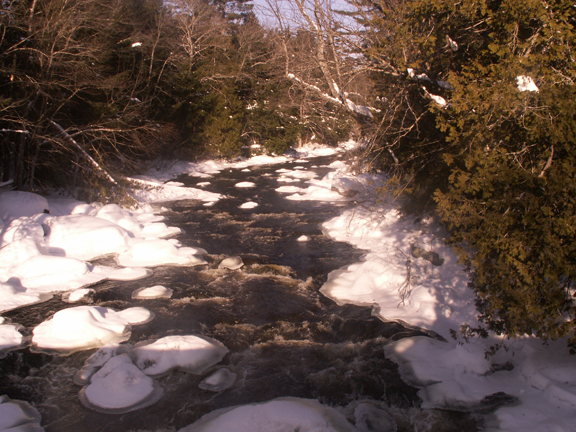 The environment of Katahdin is perfect for many wild creatures. 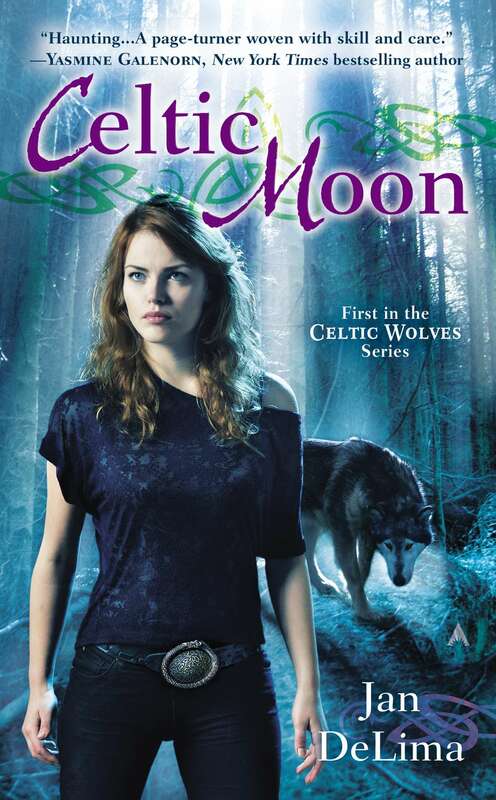 There are rumors that gray wolves have been sighted but for now they are just rumors—our own local urban legend. Wolves are in the woods of our Canadian neighbors to the north, it is not a stretch of logic that they would migrate south if the environment supports their habitat. Wolves, I suspect, don’t recognize state or country lines on human maps, only forests and food. Perhaps one day that legend will be revealed as truth. I have not seen them in my woodland adventures, but I have seen many a deer and moose. I don’t have any book news I can share just yet, other than I have seen the first draft of my cover and it is ABSOLUTELY BEAUTIFUL! I have printed it out and taped copies all over my house—and can’t wait to share it with you! Until then, I have posted a few pictures below that I took yesterday on our drive, and you can see why this area inspired more than one author over the years. My husband and I haven’t had much time to go snowmobiling this winter—Mother Nature having been a bit temperamental lately. 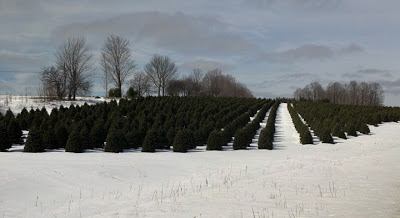 Four days ago it was twenty below in Bangor, the kind of cold that hurts when you breathe—and yesterday it was in the fifties, with wind gusts that felt like a tropical storm. My backyard is completely bare of snow, but they are already predicting more soon. We did get one ride in a month ago. I’m not comfortable riding over lakes and rivers with somewhat heavy machinery, and that’s not including myself in that weight estimate by the way, but my husband convinced me to try this sport about two years ago. My family is from this area; I have heard countless times, “You can drive a truck on that ice.” And people do, I’m not kidding, but I’ve also seen trucks that have sunken under the ice. Also, our waterways have currents. Ice doesn’t freeze well over currents. 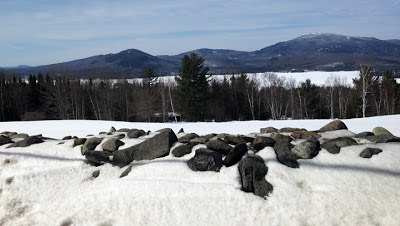 However, there are so many trails around Katahdin that don’t require sledding over ice, and I’m so glad my husband wore me down, and will admit I’ve become a bit addicted now. My favorite route is to go from Millinocket to Kokadjo, then either up to Greenville or over to Northeast Carry. The trails are like untouched highways in the middle of the forest, with panoramic views of snow-capped mountains. It is so incredibly beautiful, and I’m hoping we can get a few more rides in before spring, weather permitting. I am always inspired to write afterward, having been emersed in the surroundings of my story. 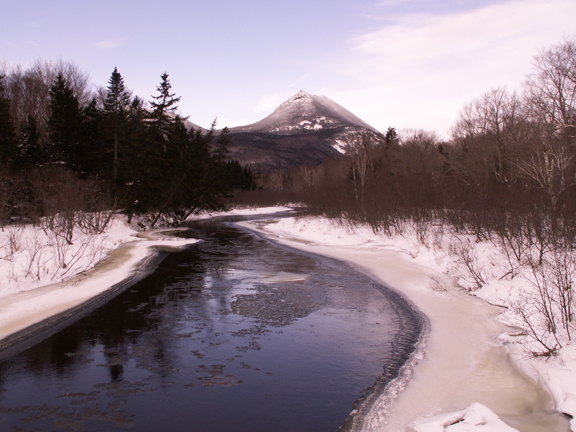 This photo was taken in Baxter State Park on Katahdin. There’s a hovering cloud covering the mountain peak that refused to budge in this last picture. I will post another photo of this view on a clear day in the future, because it is beautiful. 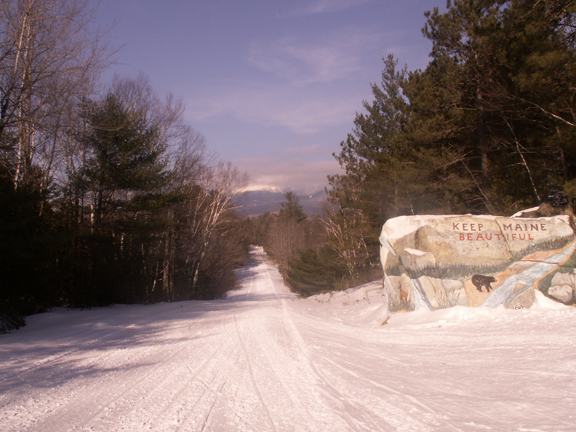 This is the road up to Baxter State Park’s entrance gate. In the winter months it becomes a snowmobile trail. I’m going to date myself here, but I can remember when that rock was covered in graffiti. I hope everyone is having a wonderful holiday. My oldest son is home from college and I wanted to share a photo that made me smile. I recently painted our living room. The former color was blood red, the “Vampire Room”, as my children liked to call it. It’s now a calming sage green, my mood of the moment. I moved much of the furniture into my son’s bedroom during the painting process. He took advantage of the temporary furniture in his bedroom, resourceful man that he is, and arranged our flat screen television for gaming at the foot of his bed. As you can see, our puppy was just thrilled to have her boy home. 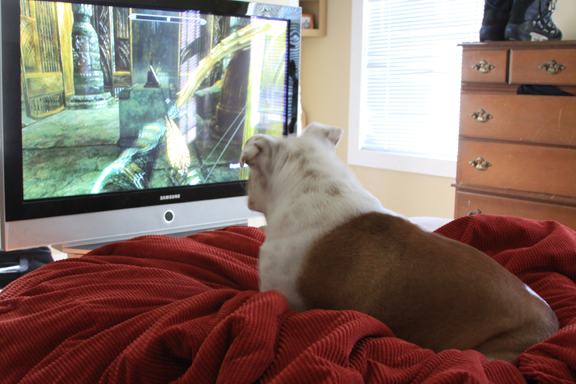 This is a photo of Willow, our baby English bulldog, nestled on my son’s feet, watching him game with our living room television.